(Dandelion (Taraxacum officinale) - 04) The common dandelion is probably the most maligned, by adults, of all wild flowers, because of its proliferation in people's lawns as an unwanted weed. Yet, as small children, we recognized its beauty and picked them for our mothers as a loving gift. This difference in our perspective is a reminder of the Biblical passage in Matthew 18:1-4, where the disciples came to Jesus and asked Him "Who then is greatest in the kingdom of heaven?" And calling a child to Himself as an example of the simplicity of faith and humbleness of spirit, He said, "Whoever then humbles himself as this child, he is the greatest in the kingdom of heaven." May we all regain and never again lose the child in us that truly recognized the beauty in all of God's creation. 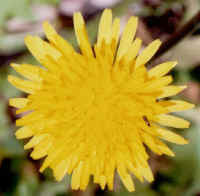 (Dandelion (Taraxacum officinale) - 03) The height of the dandelion can range from as little as two inches to nearly a foot and a half. Even without its well known flower, its oblong and pinnately lobed and toothed leaf rosettes are also easily identified. 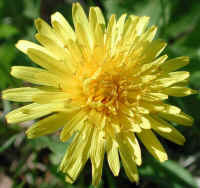 The dandelion flower is atop a single stem rising from the base of the leaf rosette. In the Spring, the dandelion leaves are tender and are a great addition to salads, or they can be cooked as are other greens. The roots can be washed, dried and ground, and steeped in hot water to make a coffee-like drink. In the past, the milky sap from the stem was used to remove warts. (Dandelion (Taraxacum officinale) - 02) The name "dandelion" is a corruption of the original French name given it by early botanists, who thought the sharp projections from the borders of the leaves resembled the teeth of a lion (dent de lion). Unlike most home owners, we look forward to seeing the dandelions blooming in our lawn each spring, along with the violets, one of which can be seen in the upper left of the photo. 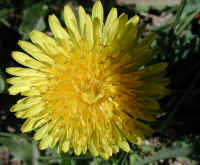 (Dandelion (Taraxacum officinale) - 01) The dandelion is a member of the Composite or Aster family and can have as many as 150 - 200 ray flowers around its central core or disc. 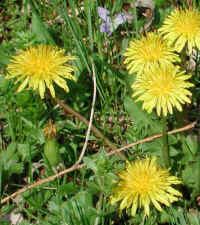 Dandelions bloom from March through October. (Dandelion (Taraxacum officinale) - 01a) This enlarged photo of the center of the dandelion disc flowers presents us with a good view of the curly-topped stamens, which are also quite evident in the shadows seen on the right side of the photo. (Dandelion (Taraxacum officinale) - 05) The Bible teaches us that strangers were always to be welcome houseguests, and that they were always offered something to eat and drink. 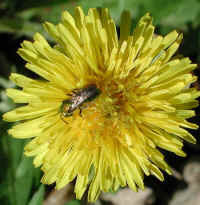 The dandelion, like other flowers, offers its guests a meal, too, and in return the insects bless the flowers with fertile seeds. 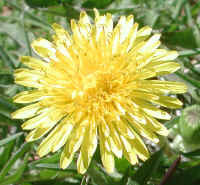 The dandelion flowers also bring their sweet flavor to humans when made into wine. The whole of creation works together in very special ways. In our position of dominion, we need to work together to preserve the whole of creation. 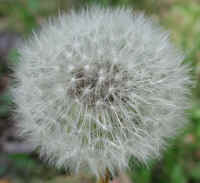 (Dandelion (Taraxacum officinale) - 06) The feathery puff ball of the dandelion seed cluster has a very special beauty. These tiny seeds are also sought after by many birds. 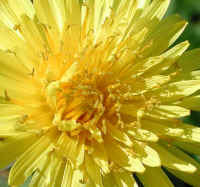 There is much more to the dandelion than seems to be generally acknowledged. It's time we correct our mistake and cherish its versatile beauty. 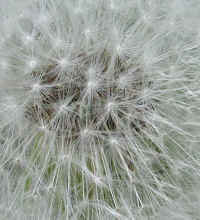 (Dandelion (Taraxacum officinale) - 06a) This enlarged photo of the dandelion seed cluster shows the feathery construction of each seed waiting for a gust of wind to carry it to a new fertile home where it can begin to develop into a new dandelion plant. 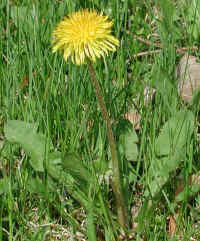 (Dandelion (Taraxacum officinale) - 07) This photo of the dandelion was taken by Dianne Stoess, who submitted it to us on 28 July 2003, with our thanks. (Dandelion (Taraxacum officinale) - 08) Every spring, before the trees sprout their leaves, the dandelions speckle the landscape with their yellow disks. (Dandelion (Taraxacum officinale) - 09) The disk flowers on this dandelion have not completely opened, and are clustered together in the center of the bloom. (Dandelion (Taraxacum officinale) - 09a) This is another dandelion bloom that is still in the process of opening. 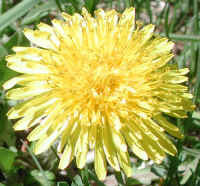 (Dandelion (Taraxacum officinale) - 10) Even while partly eclipsed by a shadow, this dandelion still shine brightly.